The most popular green tea in Japan, this elegant first grade Sencha, produces fragrant, superior flavor with a little astringent. A refreshing beverage with a very grassy aroma and sweet tasting, prized for its high vitamin content. 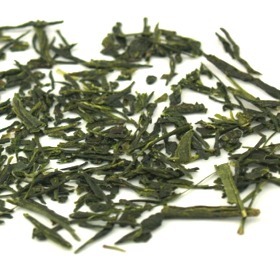 Our Sencha Green Tea come from the Shizuoka region of Japan. Gentle pungent and refreshing, complementing its wonderfully mellow and fresh aroma. Sencha, dried with warm air and rolled into needle-shape pieces with a shiny and polished appearance. I was disappointed with this sencha. The flavor is good overall, but the much of the leaves were pulverized, making it difficult to infuse properly. Tea that was far too small to be strained sits in the bottom of the cup, making the brew bitter. Love the aroma and taste, though my only real problem is with how crushed some of the leaves are such that they pass through the filters on my tea ball. Other than that, its pretty good.